Book 1 in the Foul Play series. It’s late at night. Danny Harte is investigating some burglaries near the City FC football stadium, the team he loves. He witnesses the kidnap of his favourite player, striker, Sam Roberts. As he tries to work out who did it and why, he is dragged into the twisted world of a ruthless football chairman. Shot at, abducted and led helpless to his execution, can he come out of it alive? Watch me reading from the first chapter of Foul Play here. 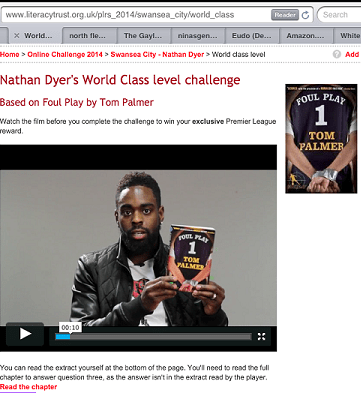 Try the Premier League Reading Star Foul Play challenge with Swansea City’s Nathan Dyer here. Find out more about the other books in the Foul Play series here. Available from your local library, bookshops, Amazon and Kindle. Emily Palmer from St Michaels RC School was the winner in the Highly Commended category for her review of Foul Play by Tom Palmer. Why did you write a crime book about football? I was reading a lot of crime stories. I like them. At the same time I read a lot about football crimes in the newspaper. Kidnaps. Corruption. Fixed games. That sort of thing. It sort of came from that. Why do you like reading crime books? They’re great. Lots of excitement and danger. But they make you think too. I like to read about detectives who slowly uncover a crime – and who get chased a few times in the process. Have you ever been chased? Yes. Twice. Once by Burnley fans, the other time by Everton fans. But I got away. It’s not a nice feeling. When I write a chase scene. I always remember how it felt having eight Everton fans on my heels. You don’t think. You just run. Whatever it takes to get away.